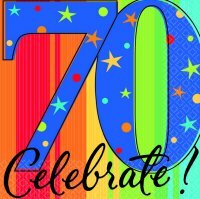 I am reading this book as part of my year-long celebration of turning 70 years old. 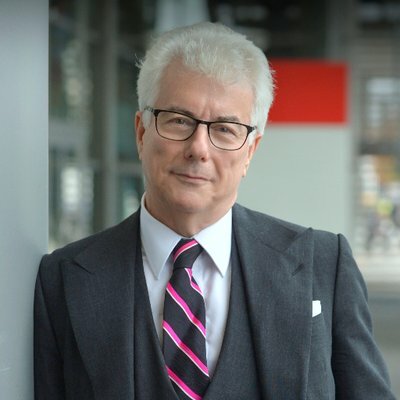 Ken Follett was born in the same year as me, 1949! 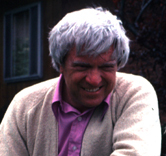 Happy Birthday this year, too, Mr. Follett! This entry was posted in Audiobooks, Mysteries on February 16, 2019 by Robin. 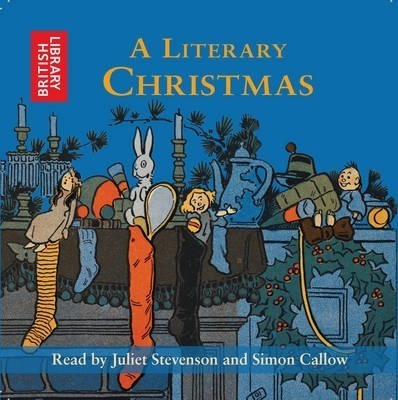 A Literary Christmas is a wonderful anthology by the British Library, full of classic Christmas stories, poems, and selections from various novels. I listened to the audiobook version, read by Juliet Stevenson and Simon Callow, and I absolutely loved it! This is one that can be listened to (or read) every December. This entry was posted in Anthologies, Audiobooks, Holiday Reading on December 17, 2018 by Robin. If I could give a six-star rating (based on the Goodreads five-star system), I would give it for this book. Becoming, by Michelle Obama, is beautifully and honestly written, full of wisdom and hope. 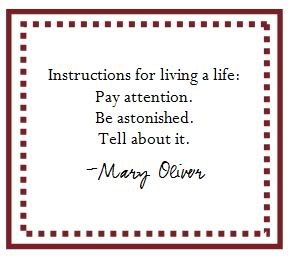 And listening to her narrate the audiobook version is a delight. It’s the best thing I’ve read in years and years! This entry was posted in Audiobooks, Heroes, History, Memoirs on November 24, 2018 by Robin. I read The Keeper of Lost Causes, by Jussi Adler-Olsen, a few weeks ago and it is one of those books that stays with you long after you finish it. The plot is complex, the characters very interesting, and the suspense keeps you turning pages long into the night. When the story begins, Carl Mørck, a brilliant detective with an anti-social personality, is just coming back to work from medical leave after recovering from a tragic attack on his investigative team that resulted in the death of one of his partners, a crippling injury to his other partner, and a bullet wound that came very close to killing him. He recovered from the bullet wound, but he has not recovered from the emotional wounds. Carl lay there a long time, as if he’d fainted, with his head full of desperate thoughts. They took his pulse and then drove off with him and his two partners. Only at the hospital did he open his eyes. They told him that his eyes had a dead look to them. They thought it was the shock, but it was from shame. His return to the police department was not welcome. He was a difficult leader, a real loner, and nobody wanted to work with him. Fortunately, a new grant had just been given to the Chief to open up a new department that would investigate cold cases. It was to be called “Department Q” and Carl was given that job, with an office in the basement, and a huge backlog of unsolved cases, or “hopeless cases,” as the police chief called them. The first case Carl chose to look at involved a popular politician who went missing five years earlier. 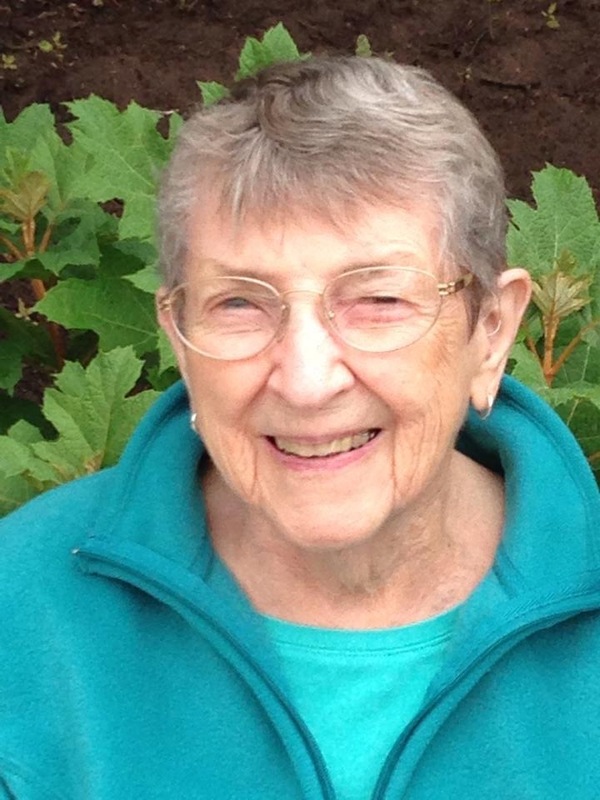 Merete Lynggaard, had disappeared while on a ferry ride with her younger disabled brother. The case had been poorly investigated, no clues were found, the case had been shelved and everyone assumed she had fallen overboard and perished. She had not. She was still very much alive, but being held captive in very cruel conditions by an unknown assailant. The course of solving this mystery was intricate and fascinating. Carl was given an assistant, Hafez el-Assad, a Syrian immigrant, to help him with the case. The two of them, both brilliant detectives, became quite an effective team. You got to know all the characters well enough to know why they each did what they did in the story. And it was one of those “unputdownable” books that kept you anxious and on alert until the very end. Somewhere inside of him, where cause and effect were not weighed against each other, and where logic and explanations never challenged consciousness, in that place where thoughts could live freely and be played out against each other—right there in that spot, things fell into place, and he understood how it all fitted together. This book is the first in a series by this author. 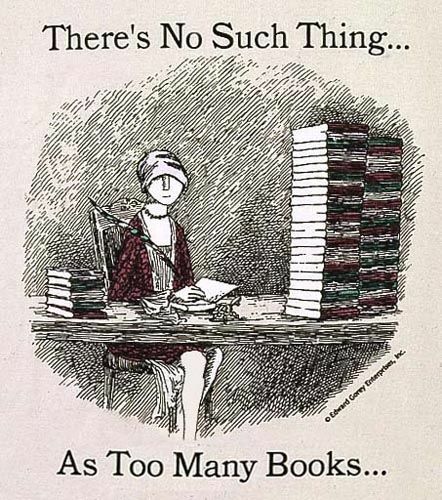 I will definitely be reading more of them! 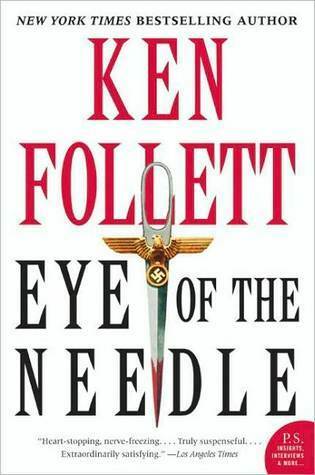 I read this book for the Readers Imbibing Peril XIII challenge. This entry was posted in Audiobooks, Challenges, Readers_Imbibing_Peril on October 15, 2018 by Robin. When I was young, I read all the Nancy Drew mysteries (at least the ones that were available at that time)! My brothers and I would go to the library every week and I would come out with a pile of books, mostly Nancy Drew mysteries. 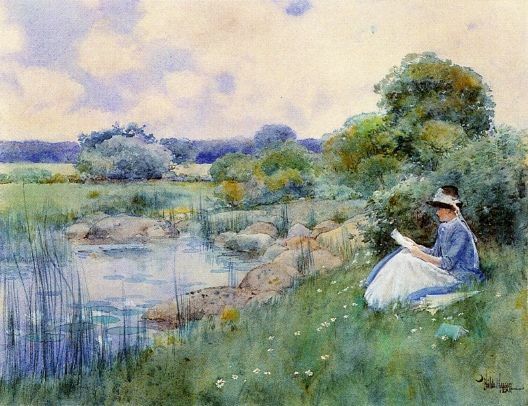 They said to me many times, “Rob, you’re in a reading rut!” Yes, that’s what good mysteries do to you, and I still love getting caught in a mystery reading rut! 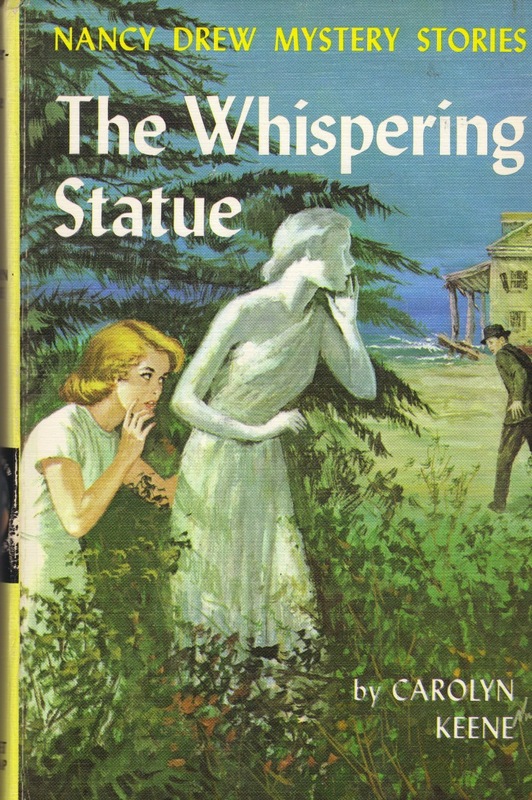 The Whispering Statue, by Carolyn Keene, is book #14 in the original series. All the Nancy Drew books were actually ghostwritten, and my favorite of the ghostwriters was Mildred A. Wirt Benson. She wrote the first twenty-three books in the series, and those are my favorites. Another interesting tidbit about the early Nancy Drew books, which were originally published in the 1930s, is that they were rewritten and republished in the 1970s. The copy I read of The Whispering Statue was definitely a rewritten one from the 70s because the plot was significantly different and shorter than the earlier version, AND the word “groovy” was used two or three times in the story. That was a dead giveaway to someone very familiar with the late 60s and early 70s!! I enjoyed rereading this mystery. 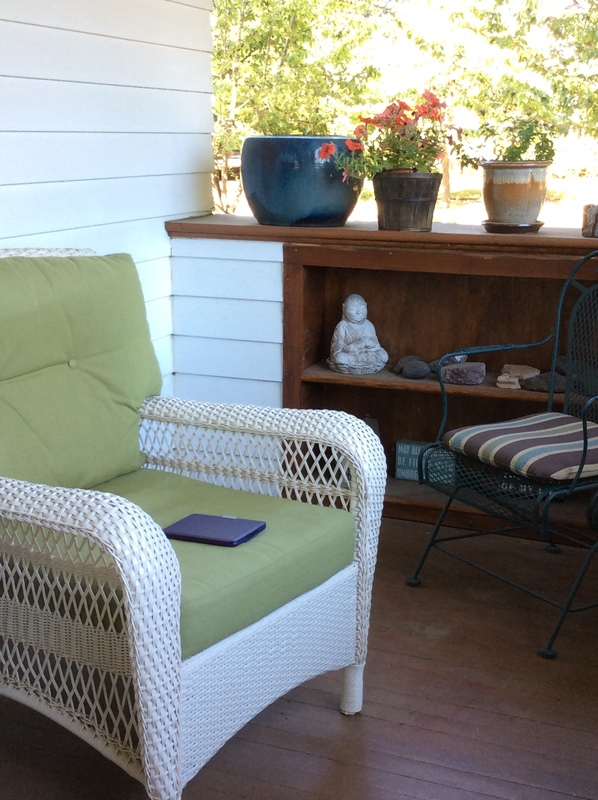 It was pleasant to spend an afternoon on the porch with a fun book. My goal is to slowly reread as many of the Nancy Drew books as possible! I read this book for the RIP XIII challenge, Peril the First. This entry was posted in Audiobooks, Challenges, Favorite authors, Rereading on September 2, 2018 by Robin. It’s so much fun when a friend recommends a book, and tells you that the audiobook version is just terrific, and you listen to that audiobook, and then you totally agree with her! That’s what just happened to me! Recently, Les (@Coastal Horizons) and Kay (@Kay’s Reading Life) and I visited a wonderful bookstore, Third Street Books, in McMinnville, Oregon. 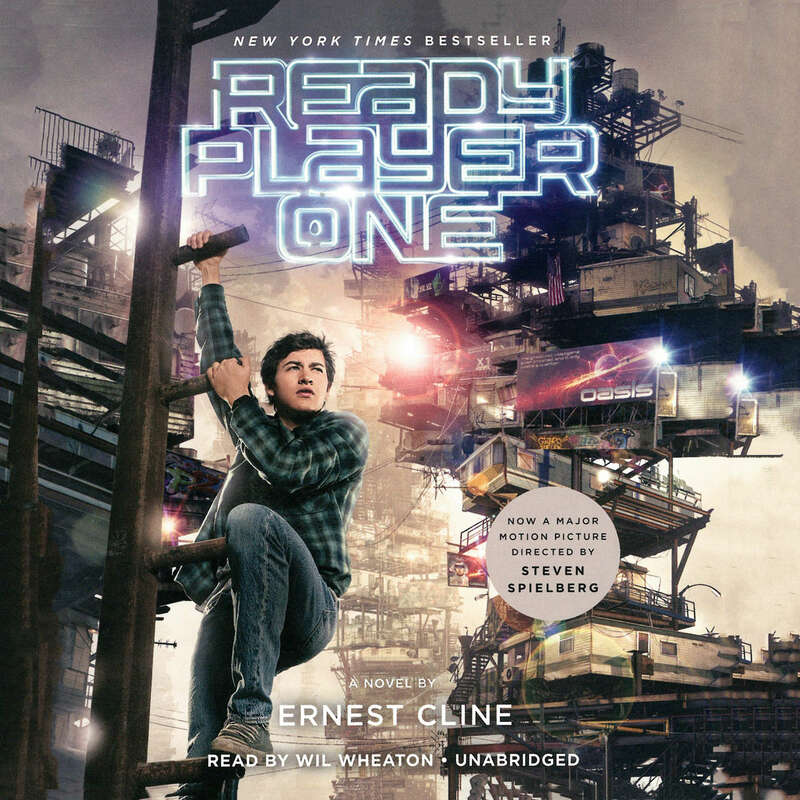 While there, Les mentioned how good the audiobook version was of Ready Player One, by Ernest Cline, narrated by Will Wheaton. So, I downloaded it and thoroughly enjoyed listening to it this month! I thought this book was wonderfully creative and fun. I kept thinking of my son throughout the story because much of the computer and video game stuff was from his growing up years, but I felt the fun was ageless. It really was a love letter to the 1980s that everyone can enjoy! At once wildly original and stuffed with irresistible nostalgia, Ready Player One is a spectacularly genre-busting, ambitious, and charming debut – part quest novel, part love story, and part virtual space opera set in a universe where spell-slinging mages battle giant Japanese robots, entire planets are inspired by Blade Runner, and flying DeLoreans achieve light speed. I haven’t seen the movie yet, but I’m looking forward to it. My friend, Adam (@Roof Beam Reader), has already warned me that it is quite different from the book, but I will give it a try and see if it is as fun as the book. Thanks, Les, for your recommendation! This entry was posted in Audiobooks, Book notes on August 26, 2018 by Robin. 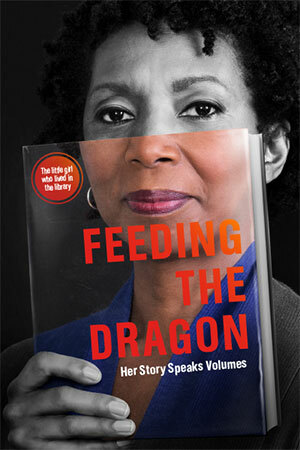 Feeding the Dragon, by Sharon Washington, was offered as an audiobook special from Audible last week. I didn’t know anything about it, but when I read that it was the story of a little girl who grew up in the New York Public Library, I knew I had to listen to it. 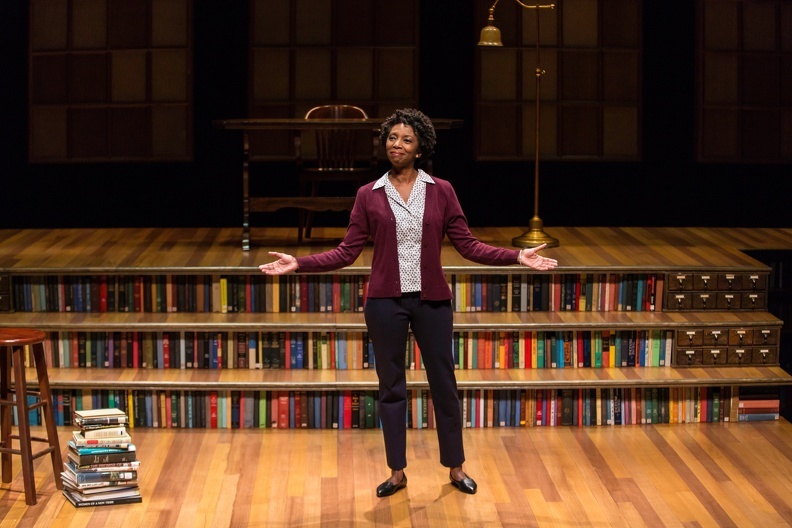 It was quite a delightful listen — Sharon Washington wrote it and was the reader, and I learned after listening to it that she has also performed it as a very successful play. It is her family story. Her father was the maintenance person at the library and kept the ancient coal-fed furnace stoked at all times, thus the idea of “feeding the dragon.” The family lived in the apartment on the top floor of the library, and Sharon grew up amongst the books downstairs. my father George, my mother Connie; my grandmother, my dog Brownie, and me. Living in a not-so-typical place. I enjoyed listening to this book and would love to see Sharon Washington’s performance of her story! New York Times review of the play, Feeding the Dragon. This entry was posted in Audiobooks, Book notes on August 19, 2018 by Robin. My book blogging friend, Andi, at Estella’s Revenge, recently listened to the audiobook of Dreams From my Father, by Barack Obama (narrated by the author). She rated it 5 stars on Goodreads, and talked about how much she enjoyed listening to it. 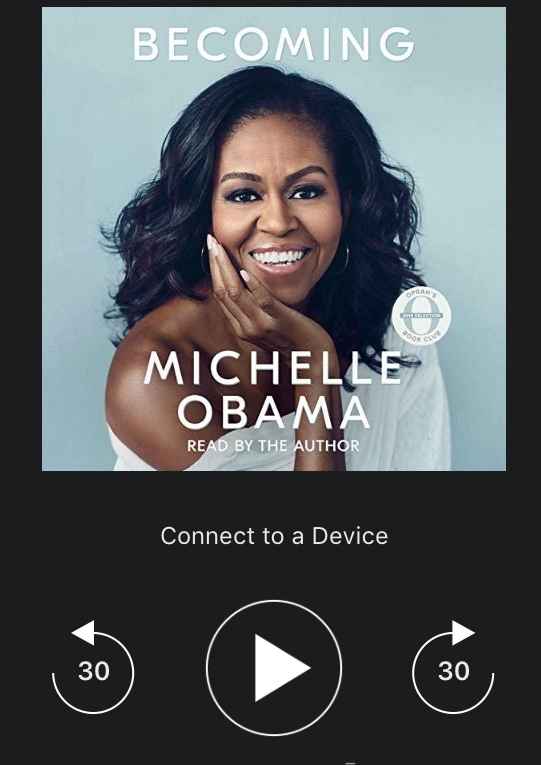 She inspired me to follow suit, so I downloaded the audiobook from Audible and am just starting it. My mother (age 98) is also going to listen to it so that we can share our thoughts about it on the phone in our daily conversations. We both miss the Obamas greatly and thought that listening to Barack Obama tell stories about his life and family would be very enjoyable. Thanks, Andi, for the idea! This little shared project is going to brighten our days! Mom and I have been sharing books and reading experiences for a lot of years! This entry was posted in Audiobooks, Memoirs, Mom, Non-fiction, Resistance reading on April 4, 2018 by Robin. I had a wonderful August this year! August is usually one of my least favorite months because of the intense and constant heat. 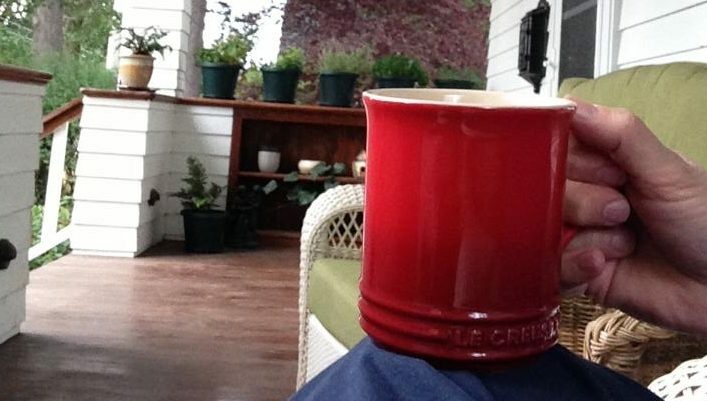 But despite record-breaking heat in our area, I loved the month! It was full of family — extended time with our grandson, and a family reunion in celebration of my mother’s 98th birthday. 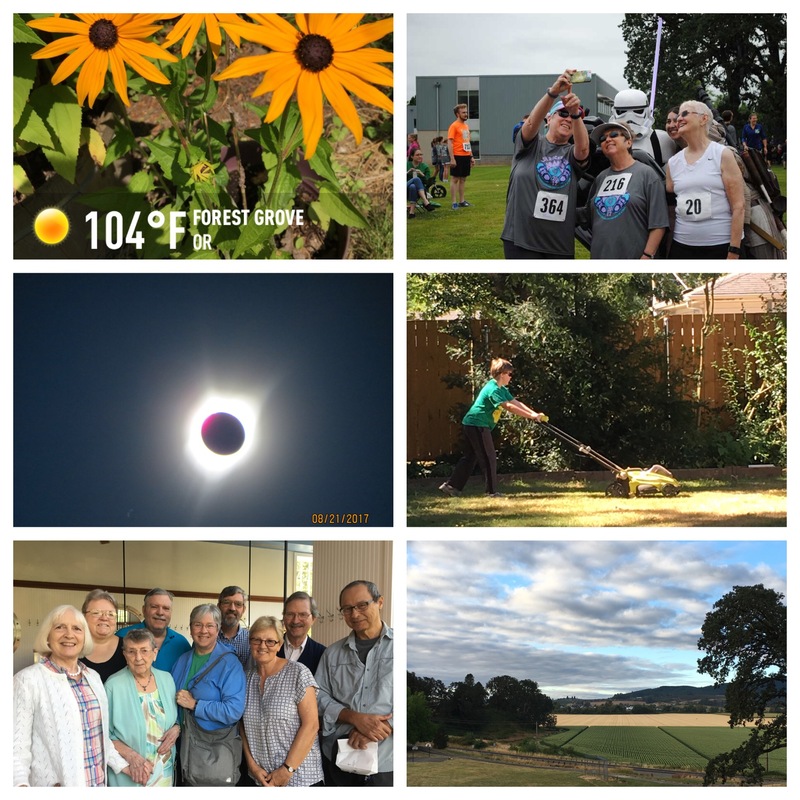 We enjoyed travel, gardening projects, 5K races, and watching the awesome total eclipse of the sun! And when it wasn’t too smoky in our area (due to the many wildfires! ), I loved the daily views on my walks and drives through this gorgeous part of Oregon. My reading time was limited, but I did enjoy 4 different books during the month. My favorite book of the month was Harry Potter and the Chamber of Secrets. I am rereading the series just for fun and as an antidote to the misery of the daily news. I also reread Jane Austen’s Northanger Abbey, which is my least favorite of her books…still. A refreshing and delightful read was of Philippa Pearce’s The Way to Sattin Shore. And a fascinating library book was The Card Catalog: Books, Cards, and Literary Treasures. It was a fun book and brought back many memories, including a memory of volunteering in the school library at my junior high school –typing cards for the catalog! So, I just have to say that August turned out to be a delightful month for me overall. I am now 5 books “behind schedule” with my Goodreads goal for the year, but that’s totally okay. The special memories from this delightful month of August will warm me through many cold winter months ahead. 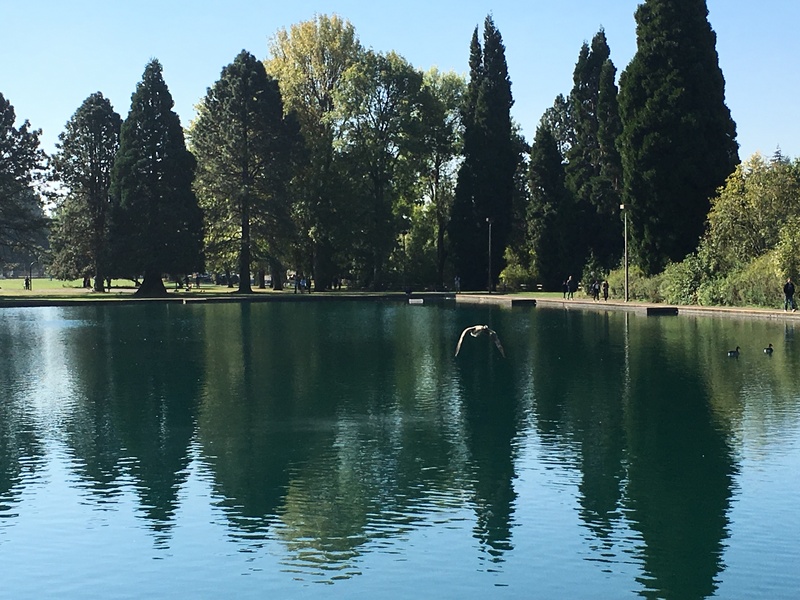 This entry was posted in Audiobooks, Book notes, Life, Mom, Reflections on September 3, 2017 by Robin. For me, this has been a summer of reading! While my blogging lagged, my reading continued and has been a real pleasure. I often copy down quotes that resonate with me from the books I’m reading, so I thought I’d share with you a few of those summer favorites so you can see where my reading journey has taken me. This entry was posted in Audiobooks, Blogging, On reading, Special quotes on August 27, 2017 by Robin.